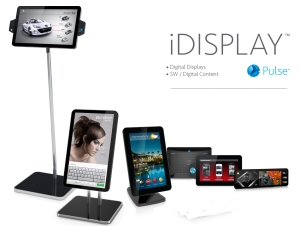 iDisplay Tablet is built for commercial use. It is an ideal interactive shelf or counter display operating on an Android operating system and powered by cloud based digitalsignage.NET & Pulse technology. This display includes all of the solutions needed for commercial locations. It can attach to any standard TV/monitor Vesa bracket and just turn on the power. A fully interactive commercial display (with built in WiFi) and a host of integrated features, in either landscape or portrait format. Consumers are automatically restricted to viewing your own content. This small footprint tablet has the option to expand 3G/4G and GPS services*via a PCIE modem (inserted in the secure back cover) and a selection of digital point of sale accessories. • Built-in digitalsignage.NET software allows for easy setup of Playlist of videos and/or stills can be scheduled.